What type of filler should I use to my product is probably the basic question packagers asked to themselves. There are literally too many assortments of filling machines that can be used in any facility. Every type of filler offers different advantages and benefits. However, there is only one filling machine that can satisfy and cater all of your filling needs. Most of the time, overflow and gravity fillers are used for filling thin products, while piston filler and pump filler will be used in filling thicker products. For special cases, the general rule will be altered if a corporation is dealing with products with different viscosity. Industries that fill products ranging from thin to thick and free-flowing products will require one specific machine that is versatile in handling the filling complexity. 1. Piston filler doesn’t only handle multiple products with different viscosity, but, it can also fill products with different container sizes and shapes. However, as the range of volume become extreme, one piston might not be able to do the task alone. Hence, it requires two or more piston to complete the filing cycle. It is also important to note that with this instance, changeover may take some time. 2. Piston filling machine can be manufactured in fully automatic form, which means that it can work with other existing equipment in the facility, like power conveyor system, capping machines, and labeling machines to create an entire packaging line. To add up, it can also be built as tabletop or portable semi-automatic machines best fit to companies that handle low to medium production demands. 3. 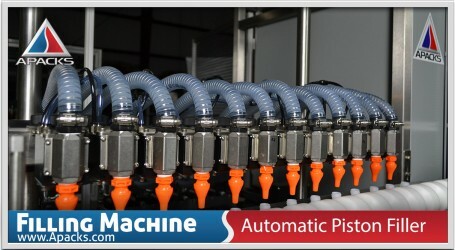 Piston filler is absolutely user-friendly equipped with a PLC controlled by an easy to use operator interface that uses a touchscreen to control the time duration and delay for indexing and filling bottles. The interface also includes a simple touchscreen power on or power off button for the fill cycle and other components or machinery that created the whole packaging line. Even though piston filler is not so accurate when it comes to economical filling, it would still be the best choice among packagers who handle numerous products that vary in viscosity. With its capacity to handle different complexity, packagers can evade the costs of buying additional liquid filler to handle another set of filling project. Thus, piston filler is a preference that should not be left unnoticed.